Over the next three years Perth will see our well known and loved shopping centres of the past evolve into major activity hubs, redefining the consumers shopping centre experience. Approximately $4.5 billion is expected to be invested in to Perth Shopping Centres by 2020, in what will be the next retail revolution. Over the past two years, Perth has already seen redevelopment of some of our major shopping centres including Westfield Whitford City and Vicinity’s Mandurah Forum. However, in the coming years, in particular the next three, we will see major redevelopment carried out with Shopping Centres such as Westfield Stirling, Garden City and Karrinyup expected to undergo redevelopments worth an estimated $450M, $750M and $800M respectively. These redevelopments are going to see a shift in tenancy mix to incorporate more service based and entertainment tenants, they are seen as the answer to the significant rise of online retailers and other factors disrupting retail. In order to attract the public and meet the expectations of the modern consumer, shopping centres are now becoming activity hubs for their surrounding communities. These activity hubs are created through remixing the retail offer by combining retail, office, residential, F&B, Entertainment, Health & Wellbeing. The challenge for shopping centre developers is to create an enjoyable space that provides the community with additional amenity that they need, shopping centres are needing to evolve in order to increase customer dwell time and therefore spending. 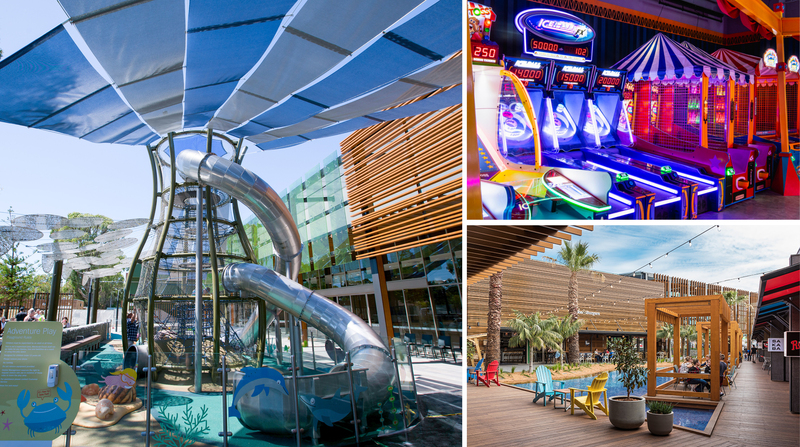 A significant element of the modern shopping centre is the inclusion of an “Entertainment & Leisure Precincts” (EPL’s) incorporating restaurants, cinemas, amusement and fast food. By including these larger food courts, restaurant zones and updated cinemas, shopping centres are becoming a place where the community will go to spend the day, not just for the shopping but for the experience. This experience is essential as the evolution of online retail and convenience shopping such as “click and collect” means that many consumers can buy their goods without the need to go into a shopping centre. Cinemas within EPL’s now offer a more boutique experience for consumers with premium seating, 3D sound technology and well-crafted menus. We are also seeing a significant rise in the inclusion of amusement centres such as iPlay, King Pin and Sky Zone. Food catering alone in shopping centres now accounts for approximately 14% of total sales, the same share as clothing & footwear stores & department stores. With the development of extravagant food hubs that include well known fast food outlets as well as bespoke operators, your favourite restaurant may no longer be on a main street but in a shopping centre. The next three years will see Perth’s Shopping Centres follow the trends of the rest of the world. The tenancy mix in our shopping centres is going to reconfigure to incorporate many more service and entertainment-based tenancies redefining the face of modern shopping centres to reflect our modern life.